A new light has appeared in the land sanctified by the feet of our Lord Jesus Christ. He is a light to guide and enlighten Orthodox Christians who was not himself the light but reflected Christ who is the Light of the World. St. John Jacob the Chozebite was canonized by the Orthodox Church of Romania in 1992 which was affirmed by the Orthodox Church of Jerusalem in 2015. St. John Jacob was born in 1913 in Romania as the only child of pious Orthodox parents Maxim and Katherine and was baptized with the name Elias. Shortly after his birth his mother fell asleep in the Lord and two years later his father also died leaving his grandmother Maria to raise him. She taught the young Elias how to pray, fast and to learn and follow the commandments of the Lord. In 1923 his grandmother also died and he was then entrusted to his uncle Alec. 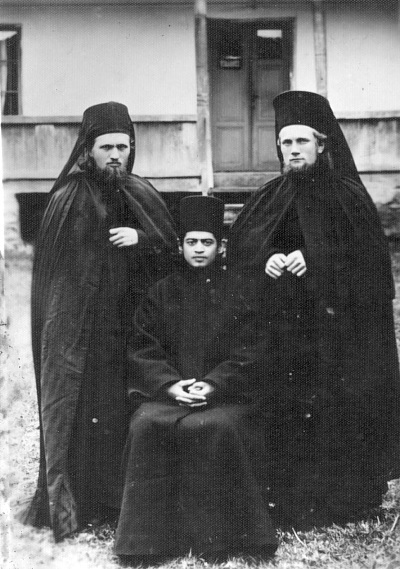 Known as a pious Orthodox Christian, his family encouraged Elias to enter the seminary to study for the priesthood. He was attracted, however, to the life of the monks who populated the many monasteries that dotted the Romanian landscape. In 1932 he packed his meager belongings and set out for the Neamt Monastery where he was received into the brotherhood and given the obedience (work) in the library and the infirmary. Two years later he was drafted into the 9th Infantry Regiment of the Romanian army serving as a male nurse and after fulfilling his military duty he returned to his monastery where he was tonsured as a monk in 1936 with the name John. Desiring more solitude and to be in the holy places sanctified by the Lord’s life, death and resurrection, he departed Romania in 1936 for the Holy Land along with two fellow monks. Venerating the holy places where the Lord Jesus suffered, died and rose from the tomb, Father John entered the community of the Monastery of Saint Sabbas in the desert wilderness. Here he remained for ten years serving as the sacristan of the monastery church: baking the prosphora (Communion bread) and maintain the order and cleanliness of the church. He also served in the monastery infirmary, tending to the sick monks as well as the local Arabs who came to the monastery for help. While his days were spent in his monastic obediences, his nights were given over to prayer and reading the Scriptures and teachings of the Holy Fathers. Desiring even greater solitude, Father John lived in a cave in the desert wilderness of Qumran, near the Dead Sea in 1939-1940. In 1947, with the blessing of the Patriarch of Romania and the Patriarch of Jerusalem, Father John was ordained deacon in the Church of the Holy Sepulchre in Jerusalem and later that same year ordained as a priest. He was assigned to oversee the Romanian Skete of St. John the Baptist in the Jordan Valley near the site of our Lord’s Baptism. Here he conducted the daily services in the Romanian language and ministered to Romanians who were on pilgrimage to the Holy Land. In 1952 Fr. John retired from his responsibilities at the Skete of St. John and moved to the St. George the Chozebite Monastery in the Hoseva desert, eventually settling in a remote cave. Here he lived for seven years with one disciple named Joanichios praying constantly, fasting, fighting against his sinful passions. His bed was a wooden plank, his food biscuits, olives and figs and water. There Father John and Father Joanichios celebrated the Divine Liturgy in the cave chapel, receiving the Body and Blood of Christ in Holy Communion. In 1960 Father John’s health began to decline and he knew that death was approaching. He received Holy Communion on August 4 and peacefully fell asleep in the Lord the next day at the young age of 47. On August 8, 1980 he relics were found to be incorrupt and fragrant, and he was canonized by the Orthodox Church of Romania in 1992. His feastday is the day of his falling asleep – August 5 (August 18 Julian calendar). His relics are enshrined in a side chapel of the Monastery of St. George the Chozebite. Those who have been blessed to be on pilgrimage to the Holy Land know this monastery for its spectacular location: is literally built into the side of a cliff in Wadi Qelt of the West Bank of Israel.